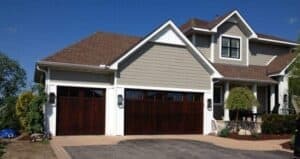 If you admire the sturdy, timeless look of a wood garage door but want to avoid the maintenance requirements, fiberglass garage doors are an ideal choice for you. Overhead Door’s fiberglass doors have a molded fiberglass surface strategically placed over an insulated steel door, resulting in a high performance door that looks like wood, but equates to low maintenance and high thermal efficiency. 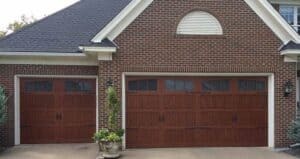 With a choice of 10 standard colors designed to give the look of stained wood and 4 standard panel styles, Overhead Door promises to give you the garage door you deserve that fits the elegance of your home. Our fiberglass doors are made with polyurethane insulation and deliver an R-value of 7.6. This high thermal insulation also dampens street noise making your home more peaceful. With so many options available, we realize it can be confusing to select the right fiberglass door. Save time, and let us do the work for you by giving us a call at (651) 683-0307. With a few simple questions, one of our experienced Overhead Door Sales Specialists will be able to help you select the fiberglass door that best fits your needs. On the other hand, if you know exactly what you are looking for in a garage door, you can review our collections and specific door specifications at Overhead Door's Company website. Can You Tell Which Door Is Wood and Which is Fiberglass? Need more help? Find helpful tips on how to choose a garage door here, or check out our FAQ's here.